Whether your kids love learning about animals, splashing in the water, or having fun in the sun, Palm Beaches in Florida has it all. This county stretches from Florida’s Atlantic coast into the state’s farm country and includes the northern edge of Everglades National Park. 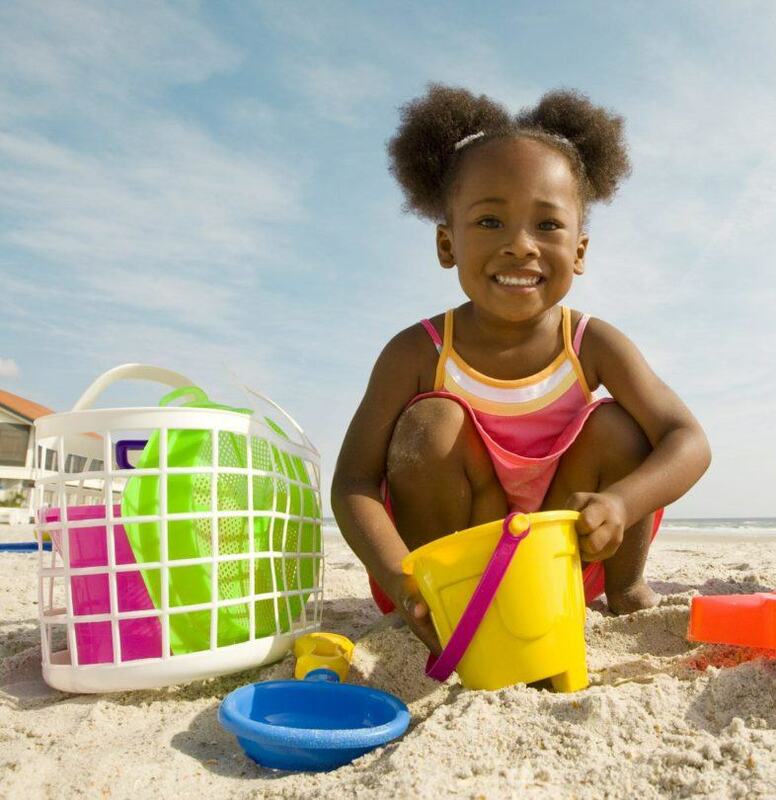 Let’s dive in to all of the fun things to do in Palm Beach County with kids! The mission at the South Florida Science Center and Aquarium is to “open every mind to science.” Since opening in 1961, this center has continued to expand its hands-on exhibits to interest scientists of all ages. For the youngest learners, parents will appreciate the 1,000-square-foot early childhood education room complete with water play, light/bright wall, dress up area and reading nook. Don’t miss live aquarium feedings and touch tank demonstrations in the new Aquariums of the Atlantic. Coming in 2017, a mini golf course to complete the renovation of their Forever Florida nature trail. Your budding astronomer will enjoy the newly upgraded observatory. Keep your family cool by catching a planetarium show. Check show times in advance as shows may sell out. 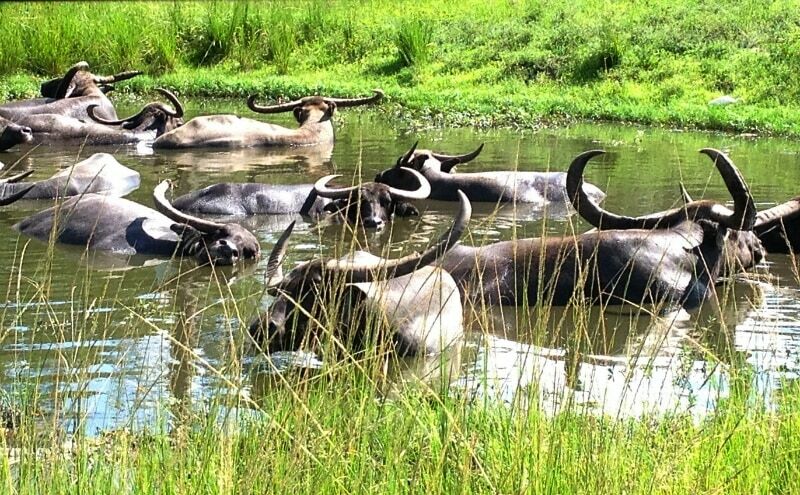 One of the most popular destinations in Palm Beaches, Lion Country Safari is home to over 900 animals and provides a big bang for your buck. Here, you have an opportunity to embark on a drive through safari from within the comfort of your air conditioned vehicle. Next up, walk through the on-site amusement park and enjoy such activities as paddle boats, a pontoon boat tour, mini golf, safari maze and more – all at no extra charge. For a small fee, visitors can feed and interact with giraffes and parakeets, or venture over to the petting zoo to feed goats and sheep. This unique adventure park combines learning and amusement with ease. If it’s in your budget, I recommend the private vehicle tour. It’s customized to view your favorite animals, plus your park guide/driver can go off road so you get closer than ever to the larger safari animals. Be sure to bring your bathing suits and sunscreen because the Safari Splash water playground is included in the price of admission. It’s a great way to cool off after visiting the animals. Your kids will have so much fun, they’ll want to stay the entire day. If your family loves camping, consider the KOA campgrounds on site. Locals and travelers alike keep cool at Rapid’s Water Park. 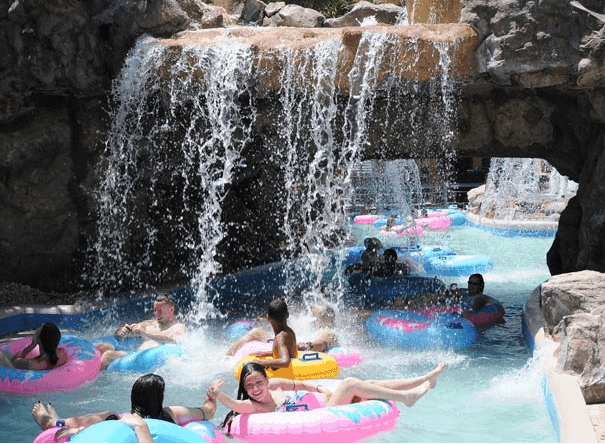 South Florida’s largest water park offers water play of all types, from a mellow lazy river to towering water slides. Little ones will love Splish Splash Lagoon with three smaller slides, a fort, water shooting cannons, floating swamp animals, a shipwreck and more. Check the weather forecast ahead of time, there are no refunds for inclement weather. The day I visited, the park shut down due to lightning right before I was able to try out Big Thunder, one of the park’s biggest thrill rides. No vacation to Palm Beach County with kids is complete without a visit to Sloan’s Ice Cream. As you open the door, the pleasant aroma of freshly pressed waffle cones beckons you in for a taste. 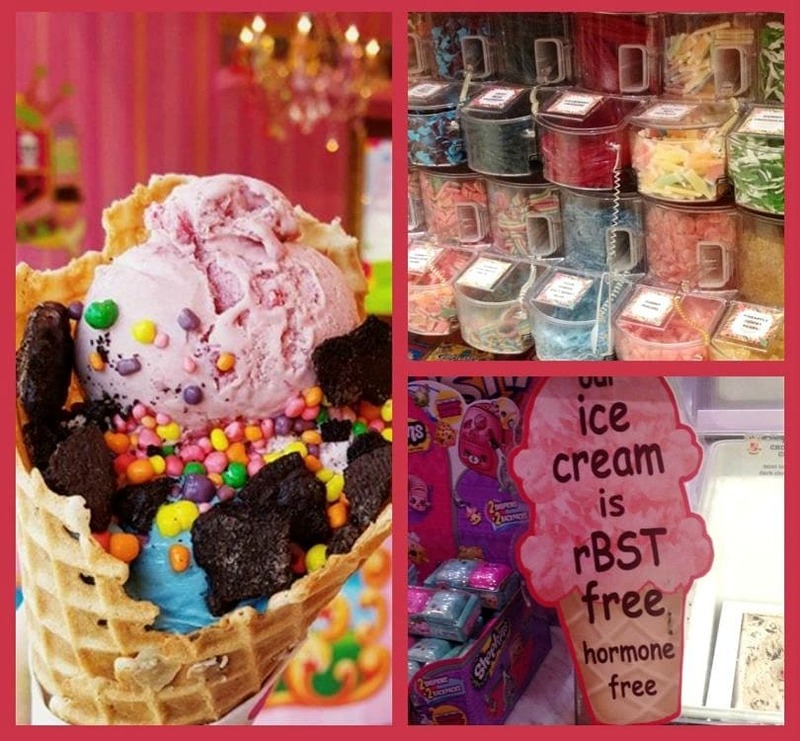 The walls are lined with sugared colors of the rainbow to tempt your sweet tooth. There’s no shortage of adventurous ice cream flavors and if you can’t make up you mind, just ask to sample one or two or three. I was thrilled to see that all of their homemade ice cream is free of rBST. The fewer added hormones we consume, the better, right? 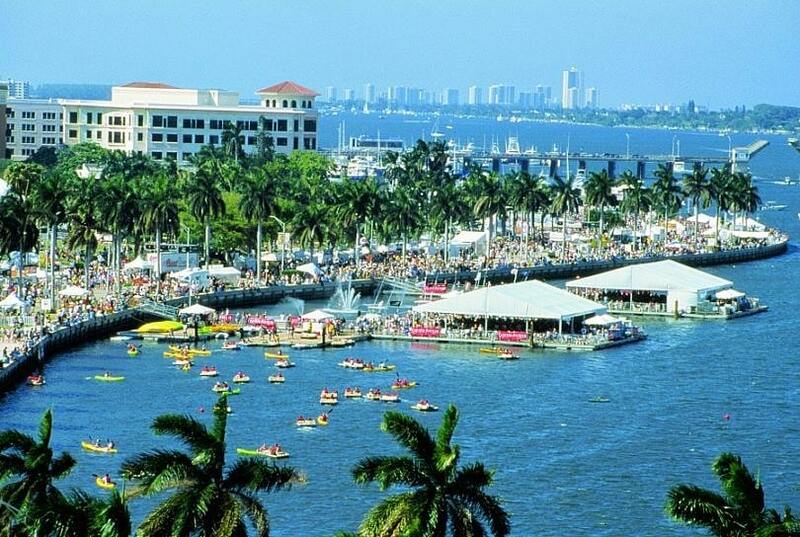 The West Palm Beach Waterfront provides a beautiful backdrop for free family activities in Palm Beach County with kids. Go here for everything from concerts and fairs to holiday events. A splash playground offers a fun way to cool down on a hot summer day. Check their website for a current listing of events and family entertainment. Still have time during your Palm Beaches vacation? Check out these additional fun options. Manatee Lagoon – View manatees up close for free at this eco-discovery attraction. Loggerhead Marinelife Center – Ocean and sea turtle conservation center. Free admission. Optional tours and experiences may cost extra. Diva Duck Amphibious Tours – A tour over land and sea that is sure to please your little ducklings. Fun Depot – Go karts, laser tag and video games for competitors of all ages. Ocean Reef Park – Beach, park, picnic. Jupiter Inlet Lighthouse – Hiking trail from which you just might spot manatees in the wild. Gumbo Limbo Nature Center – Turtle rescue center and butterfly garden. 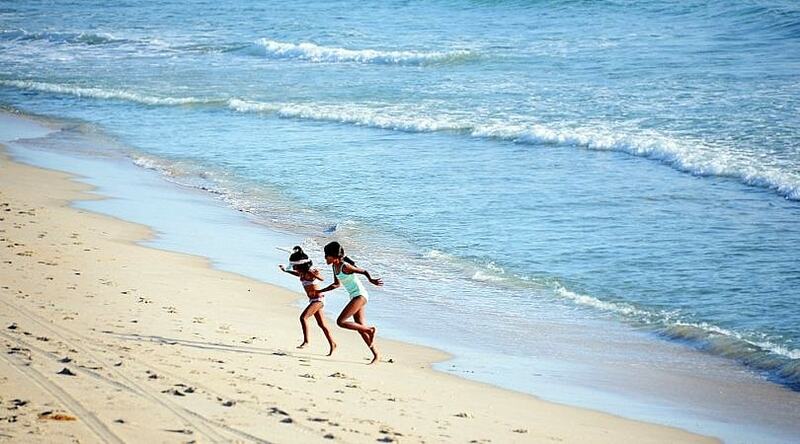 Have you been to Palm Beach County with kids? Do you have any questions or suggestions? Let us know in the comments below! 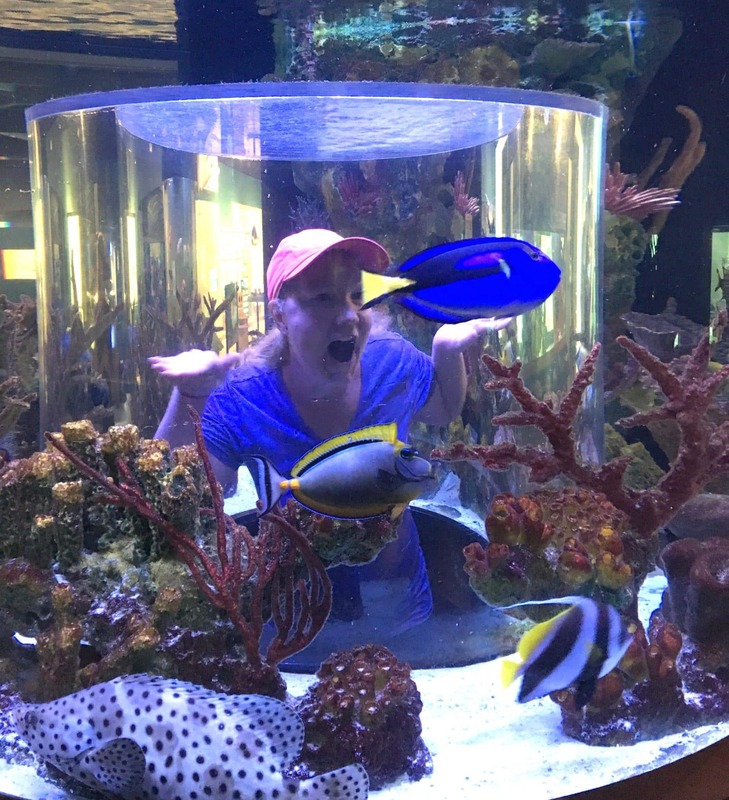 A Note from The Healthy Travel Mama: VISIT FLORIDA coordinated a media trip for the purpose of sharing family destinations. All opinions are my own, as always. This story includes affiliate links. Joann Woolley traded in the golden handcuffs of corporate America for the dream of having it all as a mompreneur, helping moms and babies better connect through baby sign language. Together with her high school sweetheart, she has three children who love to eat, play and explore. They are lucky to call San Diego home. On a personal quest to balance health and happiness, Joann explores ways to appease her family and keep her sanity while making health a top priority. Soon, she will be embarking on one of the most unique adventures, surrogacy. Help yourself to Mommy’s Slice of the Pie. Connect with her on Twitter at @sign4baby. There’s no shortage of fun in Palm Beaches, Robin. I hope you get to visit soon. These all sound like fun attractions. I would like to visit manatee lagoon some day. The manatee is really a beautiful creature, Pam. And, I think it is great for our children to learn about helping our animal friends that are endangered. Palm Beach county sounds great. All those attractions are so fun looking, and that aquarium is so neat! I love an aquarium that has other educational activities! We love Lion Country Safari. Such a fun attraction. Right? I mean, they really have a little bit of everything for every type of traveler at Lion Country Safari. I have never been to Palm Beach but it looks beautiful. I wouldn’t mind taking my family down there at some point. It is a beautiful place to visit Melisa. Hope you make it there soon! We have not been to Florida yet and we’ve had it in our bucket list for quite some time. I hope we make it there next summer and we will be taking the grandchildren with us for sure. Thanks for the suggestions on what to do and places to see in West Palm Beach county. I hope you get to take the family there sooner rather than later Annemarie, everyone will enjoy! Palm Beach sounds like so much fun! My kids would absolutely love to go on the safari and visit the aquarium! Yep, the safari is something my kids would for sure get a kick out of too Brandy. So many great adventures await you in Palm Beach! Your palm beach is the one I want to visit with my kids! I had no idea how family friendly is was and how many kid centered activities they have! Yep, I have to admit that I was quite surprised too, Melissa. What is more amazing is that it really has that perfect balance of low key relaxing aura and then the fun upbeat adventure all available. Kind of what you need when you travel with kids, right? I’m pretty sure that my kids will enjoy this places, especially the Finding Dory Aquarium and those ice creams! An ice cream you can custom make with every possible combination of flavors is every kid’s dream come true, right? Florida is such an easy escape for us, and we’ve never been here! We are definitely going to check the place out next time we head down there. And I love your photos! Thanks, Brianne! I think Palm Beaches is an often over looked destination, but I hope this helps people see what a great family friendly destination it is. I bet you will have an entirely different set of adventures that are equally fun if you’re going sans kids in September, Jocelyn! Enjoy! It never really gets dull with all these wonderful fun places in Florida. I’d love to just spend a couple of days at Palm Beach, ever since it was used in the movie The Bird Cage I’ve always been interested in the whole place! Wasn’t that a great movie, Karla? I had forgotten that movie was set in Palm Beach! I have never been to Palm Beach. It looks like a great place to visit. Thanks for putting together the list. Arlett, it is a great destination for the whole family. Glad you enjoyed reading these picks! Do you have a recommendation for lodging for my husband and I and our daughter’s families? One is 2 adults and a 7 month old. The other is 2 adults and 3 children ages one and a half to 7. It is our first big family vacation. Hi Phyllis – Good question! Joann no longer writes for TravelMamas.com but I have inquired with Visit Florida to see which Palm Beach County hotels they recommend. I’ll let you know what I find out! There certainly are a variety of hotels, resorts, villas and vacation rentals for Phyllis and her family to enjoy. A few to consider include Palm Beach Marriott Singer Island Resort & Spa, The Breakers, Hilton West Palm Beach, Eau Palm Beach Resort & Spa, Boca Raton Resort & Club and the Hyatt Delray Beach. For a full list of accommodations, she can visit http://www.palmbeachfl.com/places-to-stay/ or take advantage of exclusive hotel deals (that are seriously incredible) at http://www.PalmBeachSummer.com. These look like some really fun things to do in Florida. Personally, I think the ice cream place looks like the best option, but that’s just me! Although, I am sure that my kids would agree that it would be a great place to stop. Plus, it’s rBST free, which is great.